Your kitchen is more than just the heart of your home. It’s become the hot-spot of most households as a multi-functional space for entertaining, work, of course, dining. A well-designed kitchen will go a long way in increasing your Ashburn home’s value and upping the enjoyment of the room you spend most of your time in. While many trends come and go, some stand out. Here are five gorgeous kitchen trends you’ll love. If you’ve grown tired of looking at white cabinets, the next color that’s ready to pass white as a favorite kitchen cabinet color is gray. Gray is clean and sophisticated and can be a timeless option for both traditional and modern kitchens. It’s a neutral color, that’s close to white, so it can have staying power for years to come. When it comes to backsplashes, you can have a ton of fun, but the options can also be overwhelming when you realize backsplashes can come in all kinds of tile shapes, colors, and sizes. You can’t go wrong with a classic subway tile. Even in clean and elegant white, this simple update will give your kitchen a finished and timeless look. Don’t forget about the grout color either—using a gray or dark-colored grout will show off the tile lines and will give you the bonus of being much easier to clean than white or lighter colored grouts. In the past, granite and quartz were neck and neck as the most popular countertop options. Today, quartz is gaining popularity and for a good reason. Quartz is one of the toughest countertop materials, stronger than natural stone and will resist chips, scratches, and burn marks, making it more durable in the long run than granite counters. If you take a close look, some quartz countertops look just like granite ones. Manufacturers mix resin with crushed quartz stone to craft great-looking countertops that can be solid in color or look just like real granite. Besides being pleasing to the eye, quartz countertops are also easy to clean and maintain. And unlike granite, you won’t need to reseal it every year. While stainless steel appliances have been at the top of many people’s kitchen wish lists, all the sheen of stainless appliances can overwhelm a small kitchen. Many appliance manufacturers have been getting ready for black appliances to make a comeback. Today, you can find many refined and stylish shades like slate gray and granite black. Dark appliances are also easier to clean and don’t show fingerprints and dirt like stainless appliances. Light will never go out of style, and a well-lit, bright kitchen will give you a welcoming feel every time you step into the room. Check out LED lighting and work one of the many styles into some of your kitchen spaces to show off your favorite kitchen features. Find LEDs along toe kicks as nightlights, inside kitchen cabinets to illuminate your favorite dishes, and even tucked into crown molding to brighten ceilings. You’ll find LEDs that complement your kitchen design perfectly with colors ranging from bright to soft white, red, green, and blue. They don’t emit heat, so you don’t need to worry about damaging your cabinets or fixtures, and they’re also energy efficient—they can last an average of 50,000 hours! 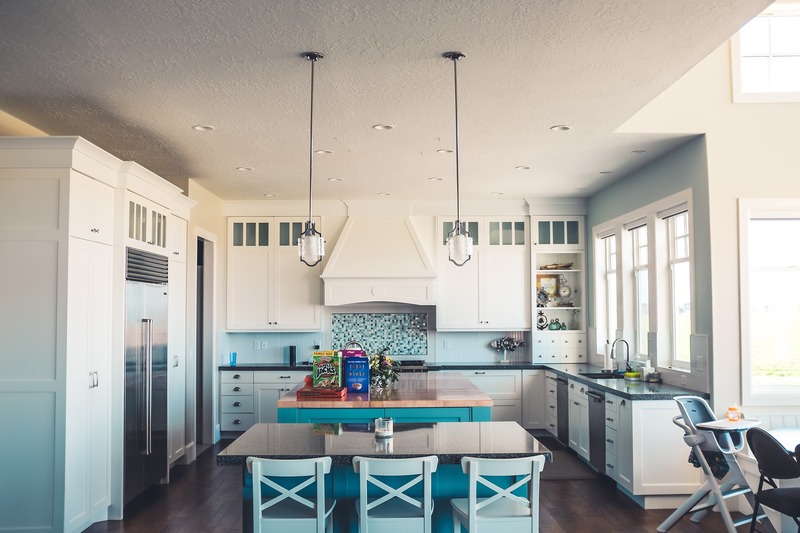 If you’re thinking of giving your Ashburn kitchen a makeover, and want to know what kitchen design trends will work best in your area, get in touch!